Here, we present a protocol for direct stereotaxic brain infusion of amyloid-beta. This methodology provides an alternative in vivo mouse model to address the short-term effects of amyloid-beta on brain neurons. Jean, Y. Y., Baleriola, J., Fà, M., Hengst, U., Troy, C. M. Stereotaxic Infusion of Oligomeric Amyloid-beta into the Mouse Hippocampus. J. Vis. Exp. (100), e52805, doi:10.3791/52805 (2015). Alzheimer’s disease is a neurodegenerative disease affecting the aging population. A key neuropathological feature of the disease is the over-production of amyloid-beta and the deposition of amyloid-beta plaques in brain regions of the afflicted individuals. Throughout the years scientists have generated numerous Alzheimer’s disease mouse models that attempt to replicate the amyloid-beta pathology. Unfortunately, the mouse models only selectively mimic the disease features. Neuronal death, a prominent effect in the brains of Alzheimer’s disease patients, is noticeably lacking in these mice. Hence, we and others have employed a method of directly infusing soluble oligomeric species of amyloid-beta - forms of amyloid-beta that have been proven to be most toxic to neurons - stereotaxically into the brain. In this report we utilize male C57BL/6J mice to document this surgical technique of increasing amyloid-beta levels in a select brain region. The infusion target is the dentate gyrus of the hippocampus because this brain structure, along with the basal forebrain that is connected by the cholinergic circuit, represents one of the areas of degeneration in the disease. The results of elevating amyloid-beta in the dentate gyrus via stereotaxic infusion reveal increases in neuron loss in the dentate gyrus within 1 week, while there is a concomitant increase in cell death and cholinergic neuron loss in the vertical limb of the diagonal band of Broca of the basal forebrain. These effects are observed up to 2 weeks. Our data suggests that the current amyloid-beta infusion model provides an alternative mouse model to address region specific neuron death in a short-term basis. The advantage of this model is that amyloid-beta can be elevated in a spatial and temporal manner. Amyloid plaque deposits, which are composed of amyloid-beta (Aβ1-42), are a key feature of the pathology of Alzheimer’s disease (AD). Numerous studies have shown that high or toxic levels of recombinant oligomeric Aβ1-42 elicit neuronal death, synaptic dystrophy, loss and dysfunction; as well as learning and memory deficits1-4. Brain regions affected include the hippocampus, the cortex, and subcortical structures such as the basal forebrain and the amygdala5,6. To date, there are multiple transgenic mouse models that attempt to simulate the Aβ1-42 pathology of AD. Depending on the strain these animals prove to be useful in examining select pathological features of AD. Unfortunately, with the exception of 2 transgenic lines, APP23 and 5XFAD, these mice never fully replicate neuronal loss, a key aspect of AD. Even with the neuronal loss observed in APP23 and 5XFAD, the neuronal death observed was subtle, age dependent, and isolated to a few select regions7,8. 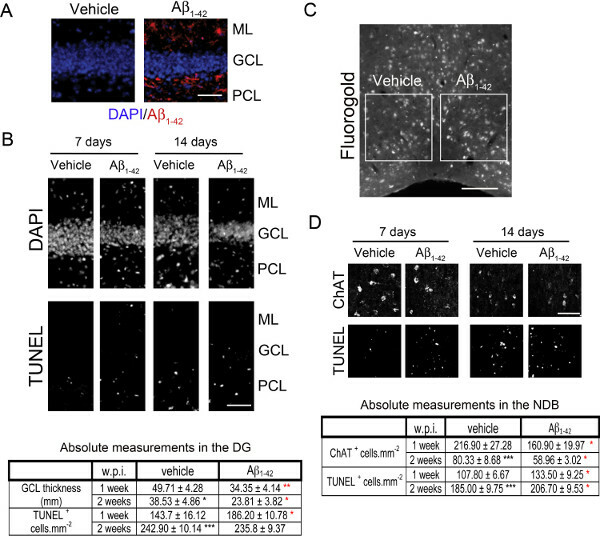 The direct infusion of oligomeric Aβ1-42 into the wild-type mouse brain provides an excellent in vivo model which replicates the neuronal death aspect of amyloidopathy1,9,10. Unlike the commonly utilized transgenic mouse models the oligomeric Aβ1-42 infusion model is ideal for acutely elevating Aβ1-42 levels in a spatial and temporal manner. The advantage of using wild-type mice for this model obviates potential compensation or side effects from the mutations introduced in transgenic mouse lines. Past studies have shown that infusing toxic levels of Aβ1-42 into the hippocampus elicits neuron death in the vicinity of the injection site within 1 week1. Moreover, consistent with the observation that Aβ1-42 is toxic for cholinergic neurons11 the basal forebrain cholinergic neuron (BFCN) population which projects to the hippocampus is decreased 20-50% within 7-14 days following beta-amyloid infusion1,10 in mice, effectively allowing for the examinations of isolated neuronal circuitry in the brain. Since BFCN project ipsilaterally to the dentate gyrus of the hippocampus12, for the most part control/vehicle and oligomeric Aβ1-42 solutions can be injected on either side of the brain allowing comparisons to be made between the left and right hemispheres1. In this report we will provide a detailed surgical and injection methodology for adult wild-type C57BL/6J mice. This mouse strain is chosen because of its wide use in research. Technically, any brain region can be targeted for infusion, however here we will use the dentate gyrus of the hippocampus as the target to illustrate the technique. Note: For all animal experimentation, Institutional and National guidelines for the care and use of laboratory animals were followed. Autoclave all stainless steel surgical instruments. Prepare 70% ethanol by diluting 200 proof absolute ethanol with sterile molecular grade deionized distilled water. Attach the 29 G needle to the Hamilton syringe. Clean the interior of Hamilton syringe and needle by drawing up and ejecting nanopure water repeatedly for 1 min. Repeat this procedure with 70% ethanol. Remove the plunger and needle from the Hamilton syringe. Air dry the parts in a laminar flow hood O/N. Irradiate the needle and syringe with ultraviolet light for 30 min before use. Prepare saline solution by dissolving NaCl in molecular grade water to a final weight to volume concentration of 0.9%. Sterilize the solution by filtering it through 0.2 μm pore filter. Monomerize and resuspend recombinant human Aβ1-42 in DMSO to 5 mM exactly as described in the publication of Fa' and others13 . Dilute 5 mM Aβ1-42 with sterile (1x) PBS to 100 µM on the day before surgery. Mix the solution well by trituration. Incubate Aβ1-42 solution for 12 hr at 4˚C. Note: Control solutions such as diluting DMSO in PBS or scrambled/reverse Aβ1-42 peptide should be prepared the same way as Aβ1-42. Use the adult mouse brain atlas to determine the exact anterior-posterior (AP), medial-lateral (ML), and dorsal-ventral (DV) coordinates for the brain region of interest14. ​Note: To illustrate the technique we picked the dentate gyrus of the hippocampus as the target with the following coordinates from the bregma: AP, -2.00 mm; ML, ±1.3 mm; DV, -2.2 mm. The negative sign preceding the AP value indicates that it is 2.00 mm posterior of the bregma. The ± sign preceding the ML value indicates left and right direction from the center. Lastly, the negative sign preceding the DV indicates it is moving ventrally from the surface of the brain. Wear a surgical face mask, clean lab coat, and sterile surgical gloves. Wipe down stereotaxic instrument and mouse adaptor with 70% ethanol. Lay down sterile surgical drape on the counter. Place the stereotaxic instrument with mouse adaptor on top of the sterile surgical drape. Wipe the mouse heating pad with 70% ethanol. Position the heating pad over the stereotaxic frame bed. Use general purpose laboratory labeling tape to tape down the heating pad over the mouse adaptor bed. Attach the heating pad to the warm water recirculator pump according to manufacturer’s directions. Turn on the warm water recirculator pump and set the temperature to 37 °C, and then wait until it reaches temperature. Affix the 50 µl Hamilton syringe with a 29 G needle onto the stereotaxic frame by screwing it onto the motorized vertical injecting shaft according to manufacturer’s directions. Turn on the bead sterilizer and wait until it reaches the manufacturer’s preset temperature. Note: This is used for sterilizing stainless steel instruments between animals. It takes instruments 20 sec of contact with the beads for sterilization. Turn on hot plate and set it to 42 °C and place a clean empty cage atop. While the Hamilton syringe is fixed on the stereotaxic frame use the motorized stereotaxic injector to draw up the Aβ1-42 solution. ​Note: Draw up more than 4 μl of the solution into the syringe and then use the stereotaxic injector to set the injecting volume. Operate the injector according to manufacturer’s instructions. Determine the weight of the mouse using the weigh scale. Anesthetize mouse with ketamine/xylazine cocktail at 100 mg/kg ketamine and 10 mg/kg xylazine by injecting intraperitoneally (IP). Monitor the depth of anesthesia by the loss of toe pinch reflex. After the mouse is sedated take the hair clipper and shave its head to expose the skin over the skull. Place the mouse on top of the heating pad on top of the stereotaxic bed. Use the spatula to open the mouth and place the incisor teeth inside the teeth guard. Secure the nosepiece over the face of the mouse. Clamp it down gently and not too tight. Position the bilateral ear crossbars into auditory meatus to secure the head. Move each crossbar in until it hits the skull, and then turn the screw to lock it. To make sure the head is secured use your index finger to gently push down on the head. If the head is properly secured it will not give out or move when pressed. Apply a drop of eye cream or eye drop to the eyes to keep them moist. Make sure the eyes are moist throughout the surgical procedure. To disinfect the surgical site use sterile cotton swabs to apply betadine solution to the skin over the skull, followed by 70% ethanol. Perform the alternating betadine and 70% ethanol cleaning 2 more times. Use a scalpel to make a 2-3 mm incision in the midline of the scalp, and then use a straight fine scissors to extend the incision line to 1.0-1.5 cm to expose the sagittal suture, bregma, and lambda of the skull, landmarks which the stereotaxic coordinates are based on. Use micro clamps to keep the skin apart. Note: The bregma and lambda positions are explained in the mouse brain atlas “The Mouse Brain in Stereotaxic Coordinates”14. Take a cotton swab, soak it in sterile saline, and use it to clean the skull. Then, use a clean dry cotton swab to dry the skull. Use a sterile fine point pen to mark a dot on the bregma. Use the stereotaxic micromanipulator to position the Hamilton syringe so that the tip of the needle just touches the dot on the bregma. To check if the AP axis of the skull is level move the Hamilton syringe posteriorly so that the tip of the needle touches the lambda point. Record the DV position. Make sure the DV coordinates for bregma and lambda are within 0.5 mm. Note: The goal is to minimize the DV difference between bregma and lambda. Use the micromanipulator to return the Hamilton syringe needle tip back to the bregma dot. Record the starting AP position. Calculate the ending AP position by subtracting 2.00 mm from the starting AP coordinate. Use the micromanipulator to reposition the Hamilton syringe needle to the final AP coordinate. Record the current ML coordinate. Calculate the left and right ending ML coordinates by adding or subtracting 1.3 mm from the starting ML coordinate. Use the micromanipulator to move the Hamilton syringe needle to either the ending ML coordinate. Touch the needle tip to the surface of the skull on both ending ML coordinates and record the DV coordinates and make sure the values are within 0.5 mm. Note: The goal is to minimize the DV difference between the two ending ML coordinates. While at an ending coordinate pull the needle up 0.5-1 cm over the skull. Take a sterile fine point pen to mark a dot on the surface of the skull. Repeat this step for the contralateral side of the skull. Swing the Hamilton syringe clear out of the way. Attach 0.8 mm drill head to the drill. Take the drill with both hands, set elbows on the surface of the table for stability, and position the drill head slightly above the sharpie dot on either the left or right ML coordinate. Activate the drill, lower the drill tip onto the skull surface to introduce a hole in the skull. Repeat this step for the contralateral side. Note: Some bleeding may occur from the newly introduced holes. If there is bleeding then use a clean dry cotton swab to dab the blood. Move the Hamilton syringe back into position over either of the newly introduced ML holes. Lower the Hamilton needle just past the skull. At this point be careful not to puncture the brain. To make sure the needle has passed the skull take your index finger and gently push the needle against the skull to make sure the needle doesn’t exit the hole. Record the starting DV coordinate. Calculate the ending DV coordinate by subtracting 2.2 mm from the starting DV coordinate. Lower the needle down to the ending DV coordinate. Activate the stereotaxic injector pump to pump 4 µl of Aβ1-42 into the dentate gyrus at a rate of 0.5 µl/min. When the infusion is complete let the needle remain in place for an additional 1 min to minimize backflow of solution out of the injection site. Move the needle to the other side of the brain and repeat steps 6.13-6.18. Unscrew the ear bars and face/nose guard. Remove the mouse from the apparatus. Use a student standard pattern forceps to pull close the scalp and then seal the wound with suture. Inject 1 ml of sterile saline into the mouse via IP for hydration. Inject buprenorphine (0.1 mg/kg) subcutaneously to relieve pain. Maintain the mouse in the clean empty cage set on top of 42 °C hot plate until it wakes, then return it to its housing cage with ample food and water. Administer buprenorphine via subcutaneous injection every 12 hr for 3 days for pain relief. Anesthetize mouse with ketamine/xylazine cocktail at 100 mg/kg ketamine and 10 mg/kg xlyazine by IP. Note: This is done 7-10 days after surgery. Use a student standard pattern forceps and straight fine scissors to remove the suture. Maintain the mouse in a clean empty cage set on top of 42 °C hot plate until it wakes, and then return it to its housing cage with ample food and water. Anesthetize the mouse and perfuse it with 4% paraformaldehyde15, remove the brain, and process it for cryosectioning16. Note: The timing of animal sacrifice depends on the experimenter. However, for our studies we chose 7 and 14 days post surgery. The present method of preparing human recombinant oligomeric Aβ1-42 yields soluble oligomeric species consisting of monomers, dimers, trimers, and tetramers (Figure 1A). These low molecular weight Aβ1-42 species, but not the fibrils and plaques, have been shown in numerous settings to be most toxic to neurons1,4,9,17-19. To determine whether or not oligomeric Aβ1-42 induces neuron death in the mouse brain Aβ1-42 (4 µl of 100 µM stock solution) was infused into the DG of the hippocampus in one hemisphere of 9 month old wild-type C57BL/6J mice. The weight of a hippocampus for C57BL/6J is estimated to be around 0.018 g and therefore the delivery of Aβ1-42 was approximately 100 μg/g. The contralateral DG of the same mouse brain was infused with a control/vehicle solution - which consisted of equal volume of DMSO used in dissolving Aβ1-42 diluted in (1x) PBS - for comparison. As mentioned previously scrambled or reverse Aβ1-42 peptide may be used as control for comparison since we previously found no effect on hippocampal neurons1. As the introduction of the needle into the brain creates local tissue damage (Figure 1B) and causes eventual DG collapse we opted to perform post-injection analyses adjacent to the injection tract where the tissue is still intact. Within 1 week of Aβ1-42 injection the DG exhibited elevated Aβ1-42 levels in the molecular layer and the polymorphic cell layer in the vicinity of the injection site (Figure 2A). 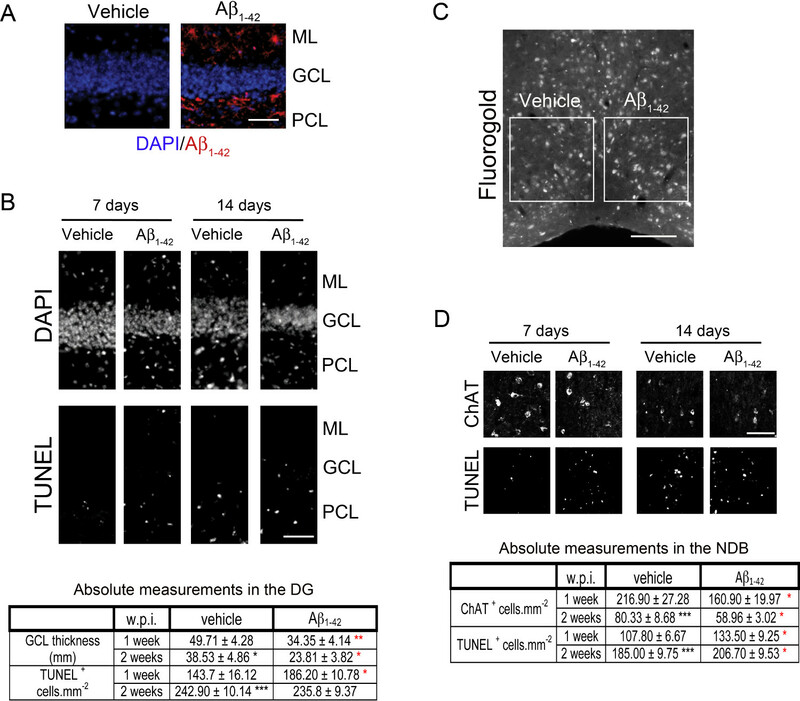 At 7 and 14 days Aβ1-42 elicited increases in TUNEL-positive staining and decreases in DG thickness, confirming the neurodegenerative effects of Aβ1-42 (Figure 2B). Because BF cholinergic neurons project to the DG of the hippocampus we determined next if the neuron loss in the DG triggers BF degeneration. For this study a retrograde tracer fluorogold (2% suspension) was co-injected along with Aβ1-42 into the DG. 7 days following injection fluorogold was detected in the BF (Figure 2C) suggesting retrograde transport of the label via cholinergic neurons. Therefore, for the purpose of quantification in the BF we chose fluorogold-positive neurons because this indicates that the neuronal terminals were exposed to Aβ1-42 in the DG. At both 1 and 2 weeks following DG Aβ1-42 infusion, the nucleus of the diagonal band – a subregion of the BF where the cholinergic neurons project to the DG – ipsilateral to the Aβ1-42-injected site exhibited increases in TUNEL staining and decreases in cholinergic neurons (Figure 2D). The observed neuron loss in the BF confirms past studies linking the destructive effects of Aβ1-42 to the BF-hippocampal pathway1,10. It is also crucial to note that from the comparison of the 2 week time point to 1 week time point on the side of the nucleus of the diagonal band where the control/vehicle solution was injected in the DG there were further increases in TUNEL staining and decreases in cholinergic neurons (Figure 2D, table). These results reflect significant decreases in the GCL thickness and increases in TUNEL-positive labeling (Figure 2B, table) in the DG of the vehicle injected side comparing between the 2 post injection time points, implying that the physical trauma caused by the needle contributes to degeneration over time. Even with this undesirable side effect of the needle, the neurodegenerative effects of Aβ1-42 are still significantly greater than those of the control/vehicle solution (Figure 2D). Taken together, the current infusion model effectively reproduces the toxic effects of Aβ1-42 in the mouse brain within 7 days making this an attractive model to study short-term Aβ1-42 stimulation. Figure 1. Oligomeric Aβ1-42 preparation and mouse brain injection tract visualization. (A) 2 µM Oligomeric Aβ1-42 was separated on 10-20% tricine gel and transferred onto nitrocellulose membrane. The membrane was blotted with Aβ1-42 antibody 6E10 (1:1,000). (B) Aβ1-42 (4 µl of 100 µM solution) or control/vehicle was infused into the left and right DGs of the hippocampus, respectively, of 9 month old C57BL/6J mice. Mice were survived for 7 days. Brains were serially sectioned at 20 µm per section. Hippocampal sections were stained for DAPI. Hash marks depict the injection tract. Arrows show collapsed DG. The scale bar represents 200 µm. Please click here to view a larger version of this figure. Figure 2. Oligomeric Aβ1-42 induces neuron death in the DG and the BF. Control/vehicle or AΒ1-42 (4 µl of 100 µM solution) was infused into the left and right DGs of the hippocampus, respectively, of 9 month old C57BL/6J mice. Mice were survived for either 7 or 14 days. Brains were serially sectioned at 20 µm per section. (A) 7 days post injection hippocampal sections stained for Aβ1-42 (NU4 antibody, 1:2,000). ML, molecular layer; GCL, ganglion cell layer; PCL, polymorphic cell layer. The scale bar represents 50 µm. (B) 7 or 14 days post injection hippocampal sections stained for DAPI or TUNEL. * p <0.05 compared to 1 week. *** p <0.001 compared to 1 week. * p <0.05 compared to vehicle. ** p <0.01 compared to vehicle. The scale bar represents 50 µm. (n = 5 mice) (C) Vehicle or Aβ1-42 co-injected with fluorogold (2% solution). Fluorogold labeling determined in the BF 7 days post-injection. Slides containing the BF were randomly chosen. Fluorogold labeling was used to determine the region of interest. Once the region of interest was identified adjacent brain slices were used to stain for markers of interest. The insets are regions in which images in (D) are chosen. The scale bar represents 200 µm. (D) 7 or 14 days post injection BF sections stained for ChAT (1:100, goat polyclonal) or TUNEL. *** p <0.001 compared to 1 week. * p <0.05 compared to vehicle. Quantification was done on the entire region of interest. The boundary between the medial septum and the diagonal band is delineated based on the location of the anterior commissure. The scale bar represents 100 µm. (n = 5 mice). Please click here to view a larger version of this figure. To achieve a successful Aβ1-42 injection the experimenter or surgeon must: 1) use aseptic technique; 2) correctly identify the brain region of interest with accurate coordinates; 3) be able to properly secure the mouse in the stereotaxic frame with the brain leveled in the AP and ML axis; 4) have the ability to operate the micromanipulator with precision; 5) ensure proper post-operative care. If these key steps are followed the mouse should survive the surgery with no observable infection. In accord with in vitro studies, we and others have shown that Aβ1-42 directly infused into the hippocampus elicits neuron death1,4,9,10, depicting one of the key features of AD. The degeneration is clearly evident in the vicinity of the injection site as shown by a decreased in the volume of the dentate gyrus that is complemented by increases in markers for degeneration1. Furthermore, the cholinergic neurons that project to the hippocampus die in a retrograde fashion as shown by a decrease in cholinergic labeling and an increase in TUNEL-positive staining in the BF1,10. Hence, this in vivo model serves as an excellent model to investigate the semi-acute effects of Aβ1-42 locally. The key advantage of this injection model is its dynamic nature: any brain region may be targeted and different aged animals may be used. 9 month old male mice were chosen in our experiments because we believe increasing Aβ1-42 levels in older mice better simulates the disease which occurs in older people. Moreover, we aim to keep the experiments consistent by using mice of the same age. However, mice of any age could be used for the injection. In the past we have experimented on mice that were 16 months old and others have used mice that were 2 months old9,10. Only male mice should be used in studies as female mice exhibit estrogen level fluctuations and estrogen is known to have neuroprotective effects20. Although many research interests center around the pathological effects of Aβ1-42, there is also evidence that low or physiological Aβ1-42 levels are required for normal functions for learning and memory21,22. In these studies investigators lowered the concentration of Aβ1-42 injected and infused it into the hippocampus22,23, effectively revealing yet another example of the dynamic nature of the utility of this paradigm. Other compounds that have been successfully infused stereotaxically include drugs, viruses, siRNA, antibodies, and peptides1,22-26 to investigate various effects ranging from cell death/survival to animal behavior. Thus, there are numerous applications for employing this infusion paradigm. The described infusion methodology, while exhibiting various potentials for in vivo studies using this technique, also comes with inherent limitations. First, this model only attempts to reproduce the effects of Aβ1-42 in an isolated brain region. Second, the injection site is damaged from the introduction of a needle into the brain. This contributes to additional cell death and gliosis. Therefore, analysis has to be performed away from the injection tract. With appropriate vehicle control on the contralateral side of the same brain this should not be a problem as the injected vehicle and Aβ1-42 solutions spread to surrounding tissue. Third, because BF cholinergic neurons project to the hippocampus, the physical damage of the hippocampus as evident by the collapse of the DG by the needle (Figure 1B) may inadvertently kill some BFCNs. Fortunately, examining the neuronal circuitry in the short term – within 1 week of a single-shot infusion - does not pose a problem since our data suggests that the increased cholinergic death in the basal forebrain is the result of Aβ1-42 and not from the trauma of the needle; control injections provide the appropriate analysis. The data suggest that the degeneration of the DG is also necessary for the loss of BF cholinergic neurons as these neurons lose their synaptic targets (Figure 2B). Unfortunately, for animals surviving up to 2 weeks the vehicle injected side shows significant elevation of BFCN death over 1 week post-vehicle injected animals that appears to be due in part to the degeneration and thinning of the dentate gyrus resulting from the physical trauma of the needle. However, even at this stage the data suggests there is significantly more death in the BF ipsilateral to the Aβ1-42-injected site. Fourth, identifying subtle anatomic boundaries may be difficult to achieve. For example, the boundary between the medial septum and the diagonal band was determined based on the location of the anterior commissure, a technique that was previously described27. Furthermore, because of the ipsilateral BF cholinergic neuronal projection – mainly from the medial septum and the vertical limb of the diagonal band (MS/DB) - to the dentate gyrus of the hippocampus12,28,29 we decided to inject one hemisphere with Aβ1-42 and use the opposite hemisphere as control for comparison. It is conceivable that a concern for this paradigm would be the proper identification of the boundary separating left and right MS/DB. While the MS is in the midline region, the DBs are more lateral. For this current work and our most recent publication1 we were able to comfortably distinguish left and right DB. Our quantification reveals ChAT(+) neurons decrease by approximately 25% in the DB in the Aβ1-42 -injected side. However, we did not detect any significant changes in the ChAT(+) neurons in the MS1. Because of the lateral location of the DBs and the changes observed we felt we were justified to employ vehicle and Aβ1-42 injections within the same animal. Furthermore, testing 2 different experimental conditions within the same animal not only maximizes the use of the animal but also reduces potential animal-to-animal variability. While our experimental design allows us to compare left and right hemispheres it is conceivable this comparison technique may not be feasible in future studies, i.e., if the medial septum is the main focus of the study. In such case each animal will have to serve as an experimental condition. Hence, the use of animals is at the discretion of the experimenters. Fifth, can the current injection model be used for other read-outs such as behavior? Our purpose in employing the current Aβ1-42 injection model was to assess the neuropathological effects of Aβ1-42 in vivo and compare it to in vitro findings1. To that end, it serves its purpose. AD is a disease that affects the memory and behavior functions of an individual. Thus, it is natural to ask whether the current model may be used for behavior studies. To expand the current model into behavior studies experimenters will have to characterize the model further and may have to adjust the injection strategy. For example, since we observed DG degeneration (Figure 1B and 2B) when we target the injection needle into or near the DG at 7 days the destruction of the DG may give rise to unintended behavioral abnormalities. Hence, if a study requires examining the effect of Aβ1-42 on the hippocampal-dependent behavior, then the injection target may have to be repositioned near the hippocampus rather than directly into it and allow Aβ1-42 to diffuse into the hippocampus. That said, the use of the current injection paradigm for behavior testing is possible but requires more testing and characterization, and the final experimental strategy will be determined by the end user. Interestingly, there have been prior rodent behavior studies that involve external delivery of Aβ1-42 directly into the brain.22,30 Taken together, these limitations need to be considered when designing in vivo mouse studies employing this model. Since no single mouse model in existence captures the full pathological effects of AD the stereotaxic Aβ1-42 infusion technique provides experimenters with an alternative in vivo Aβ1-42 mouse model. When performed by a well trained individual this model is best suited for short term studies focusing on the effects of Aβ1-42 on a specific brain region or circuitry. This work was supported by National Institute of Neurological Disorders and Stroke grant NS081333 (to CMT), Alzheimer’s Association grant NIRG-10-171721 and National Institute of Mental Health grant MH096702 (to UH), and National Institute on Aging-funded Alzheimer’s Disease Research Center at Columbia University pilot grant AG008702 (to YYJ and JB). Vetbond Tissue Adhesive (3M) Santa Cruz Biotechnology sc-361931 Optional: for aiding in wound closure; Use with suture. Baleriola, J., et al. Axonally Synthesized ATF4 Transmits a Neurodegenerative Signal across Brain Regions. Cell. 158, (5), 1159-1172 (2014). Haass, C., Selkoe, D. J. Soluble protein oligomers in neurodegeneration: lessons from the Alzheimer's amyloid beta-peptide. Nature reviews. Molecular cell biology. 8, (2), 101-112 (2007). Knowles, J. K., et al. The p75 neurotrophin receptor promotes amyloid-beta(1-42)-induced neuritic dystrophy in vitro and in vivo. The Journal of neuroscience : the official journal of the Society for Neuroscience. 29, (34), 10627-10637 (2009). Troy, C. M., et al. beta-Amyloid-induced neuronal apoptosis requires c-Jun N-terminal kinase activation. Journal of neurochemistry. 77, (1), 157-164 (2001). Crews, L., Rockenstein, E., Masliah, E. APP transgenic modeling of Alzheimer's disease: mechanisms of neurodegeneration and aberrant neurogenesis. Brain structure & function. 214, (2-3), 111-126 (2010). Gotz, J., Ittner, L. M. Animal models of Alzheimer's disease and frontotemporal dementia. Nature reviews. Neuroscience. 9, (7), 532-544 (2008). Calhoun, M. E., et al. Neuron loss in APP transgenic mice. Nature. 395, (6704), 755-756 (1998). Oakley, H., et al. Intraneuronal beta-amyloid aggregates, neurodegeneration, and neuron loss in transgenic mice with five familial Alzheimer's disease mutations: potential factors in amyloid plaque formation. The Journal of neuroscience : the official journal of the Society for Neuroscience. 26, (40), 10129-10140 (2006). Jean, Y. Y., et al. Caspase-2 is essential for c-Jun transcriptional activation and Bim induction in neuron death. The Biochemical journal. 455, (1), 15-25 (2013). Sotthibundhu, A., et al. Beta-amyloid(1-42) induces neuronal death through the p75 neurotrophin receptor. The Journal of neuroscience : the official journal of the Society for Neuroscience. 28, (15), 3941-3946 (2008). Kar, S., Quirion, R. Amyloid beta peptides and central cholinergic neurons: functional interrelationship and relevance to Alzheimer's disease pathology. Progress in brain research. 145, 261-274 (2004). Leranth, C., Frotscher, M. Organization of the septal region in the rat brain: cholinergic-GABAergic interconnections and the termination of hippocampo-septal fibers. The Journal of comparative neurology. 289, (2), 304-314 (1989). Fa, M., et al. Preparation of oligomeric beta-amyloid 1-42 and induction of synaptic plasticity impairment on hippocampal slices. Journal of visualized experiments : JoVE. (41), (2010). Paxinos, G., Franklin, K. B. J. The Mouse Brain in Stereotaxic Coordinates. Second edn, Academic Press. (2001). Gage, G. J., Kipke, D. R., Shain, W. Whole animal perfusion fixation for rodents. Journal of visualized experiments : JoVE. (65), (2012). Currle, D. S., Monuki, E. S. Flash freezing and cryosectioning E12.5 mouse brain. Journal of visualized experiments : JoVE. (4), (2007). Jin, M., et al. Soluble amyloid beta-protein dimers isolated from Alzheimer cortex directly induce Tau hyperphosphorylation and neuritic degeneration. Proceedings of the National Academy of Sciences of the United States of America. 108, (14), 5819-5824 (2011). Lambert, M. P., et al. Diffusible, nonfibrillar ligands derived from Abeta1-42 are potent central nervous system neurotoxins. Proceedings of the National Academy of Sciences of the United States of America. 95, (11), 6448-6453 (1998). Masters, C. L., Selkoe, D. J. Biochemistry of amyloid beta-protein and amyloid deposits in Alzheimer disease. Cold Spring Harbor perspectives in medicine. 2, (6), a006262 (2012). Chakrabarti, M., et al. Estrogen receptor agonists for attenuation of neuroinflammation and neurodegeneration. Brain research bulletin. 109C, 22-31 (2014). Cirrito, J. R., et al. In vivo assessment of brain interstitial fluid with microdialysis reveals plaque-associated changes in amyloid-beta metabolism and half-life. The Journal of neuroscience : the official journal of the Society for Neuroscience. 23, (26), 8844-8853 (2003). Puzzo, D., et al. Picomolar amyloid-beta positively modulates synaptic plasticity and memory in hippocampus. The Journal of neuroscience : the official journal of the Society for Neuroscience. 28, (53), 14537-14545 (2008). Puzzo, D., et al. Endogenous amyloid-beta is necessary for hippocampal synaptic plasticity and memory. Annals of. 69, (5), 819-830 (2011). Akpan, N., et al. Intranasal delivery of caspase-9 inhibitor reduces caspase-6-dependent axon/neuron loss and improves neurological function after stroke. The Journal of neuroscience : the official journal of the Society for Neuroscience. 31, (24), 8894-8904 (2011). Fulmer, C. G., et al. Astrocyte-derived BDNF supports myelin protein synthesis after cuprizone-induced demyelination. The Journal of neuroscience : the official journal of the Society for Neuroscience. 34, (24), 8186-8196 (2014). Thakker-Varia, S., et al. The neuropeptide VGF is reduced in human bipolar postmortem brain and contributes to some of the behavioral and molecular effects of lithium. The Journal of neuroscience : the official journal of the Society for Neuroscience. 30, (28), 9368-9380 (2010). Greferath, U., et al. Enlarged cholinergic forebrain neurons and improved spatial learning in p75 knockout mice. The European journal of neuroscience. 12, (3), 885-893 (2000). Brashear, H. R., Zaborszky, L., Heimer, L. Distribution of GABAergic and cholinergic neurons in the rat diagonal band. Neuroscience. 17, (2), 439-451 (1986). Clarke, D. J. Cholinergic innervation of the rat dentate gyrus: an immunocytochemical and electron microscopical study. Brain research. 360, (1-2), 349-354 (1985). Garcia-Osta, A., Alberini, C. M. Amyloid beta mediates memory formation. Learning & memory. 16, (4), 267-272 (2009).